Representative Honours: Northern Ireland: 50 Full Caps/4 Goals (1968-1980); 2 Under-23 Caps (1968-1969); Irish League: 3 Caps (1968-1970). Club Honours: (with Linfield) Irish League Champion 1968/69, 1970/71; Irish Cup Winner 1969/70; (with Ipswich) Texaco Cup Winner 1972/73; (with Everton) Football League Cup Runner-Up 1976/77. 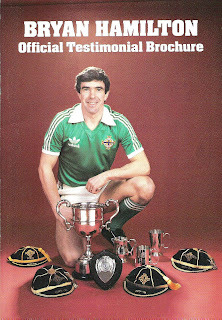 Awards: Ulster Footballer of the Year 1971; NI Football Writers' Footballer of the Year 1971. Bryan Hamilton began his footballing career with Distillery, making his debut as a seventeen year-old early in the 1964/65 season. His return of 26 goals in 49 games persuaded Linfield to offer him a professional contract in June 1966, and at Windsor Park he was to develop into one of the Irish League’s most feared forwards. In his first season with Linfield, his two goals in the European Cup helped the club to a best-ever quarter-final place, where they lost out narrowly to CSKA Moscow, 3-2 on aggregate. The following two season brought Irish Cup, Irish League, City Cup, Gold Cup and Ulster Cup successes, and Hamilton his first major representative honours, with an Inter-League debut against the Football League in November 1968, and two weeks later Billy Bingham awarded him his first International cap in a 3-0 World Cup Qualifier win over Turkey. Billy Bingham’s appointment as Linfield manager in 1970, along with his continuing role as Northern Ireland manager, brought Hamilton his best season to that date. He top-scored in the Irish League with eighteen goals, was ‘Double’ Player of the Year, claimed his second Irish League Champion’s medal, a Blaxnit All-Ireland Cup winner’s medal, as well as further Gold Cup and Ulster Cup successes. 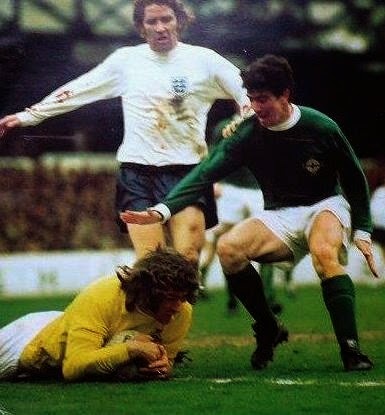 He also regained his place in the International eleven, and played in every Northern Ireland match through 1971. Hamilton made his Football League debut in the opening game of the 1971/72 season in a 0-0 home draw with Everton. Although he spent his first year at Portman Road acclimatising to the full-time game, largely appearing from the bench, as Ipswich attained a mid-table spot in Division One. From the start of the 1972/73 season on he was a virtual ever-present in the Ipswich team for the next three-and-a-half seasons. In his first campaign as a regular, Hamilton helped Ipswich to a 4-2 aggregate win over East-Anglia rivals Norwich in the Texaco Cup Final, and fourth place in the League, thus guaranteeing European football. Ipswich reached the quarter-finals of the UEFA Cup in 1974, and once again attained fourth in the League as Hamilton enjoyed his best season’s goal-scoring total in English football with 16 League strikes (19 in all competitions). By now playing in a more-modern attacking midfielder role (the term inside-forward having fallen into disuse), Hamilton and Ipswich came within two points of the League Championship (and lost out on second place on goal average) in 1975 as well as a nine-game route to the FA Cup semi-finals, where they lost out in a replay to eventual winners, West Ham. Mid-way through the 1975/76 season Hamilton once again teamed up with Billy Bingham, by then Everton boss, splashing £40,000 on his one-time protégé as the Toffees sought a midfielder who could score goals. Hamilton was a regular from his debut against Leeds on 29th November 1975, through to the end of season. The team were settling in a mid-table spot well below fans’ expectations, and Bingham was coming under pressure. Mid-way through the following campaign, with Hamilton in-and-out of the team, Bingham was sacked. In the absence of his long-time mentor, Hamilton appeared in the three matches it took to settle the League Cup Final, 3-2 in Aston Villa’s favour, and had what would have been the winning goal controversially ruled out in an FA Cup semi-final draw with Liverpool (who took the replay 3-0). On the international stage, Hamilton had cemented his place in midfield, usually on the right-hand side. In April 1975 when Northern Ireland played their first match in Belfast in almost three-and-a-half years, he marked the occasion with the only goal in a 1-0 victory over Yugoslavia. Through the remainder of the 1970s Hamilton began to fulfil a deeper lying midfield role, and even filled in at right-back in a number of matches. In July 1977 Hamilton made a cut-price £12,500 move to Millwall as new Everton boss Colin Lee attempted to make his mark on the squad. At the Den, Hamilton found himself playing outside the top-tier for the first time in his career. Installed as team captain immediately on his arrival, Hamilton’s early Millwall career was characterised by poor individual form as the team struggled. It was only in the second-half of the season that Hamilton’s class and experience shone through, and a run of six consecutive wins in the final games pulled Millwall away from the relegation zone. In November 1978 Millwall decided to cash-in on a £20,000 bid for a player approaching his 32nd birthday, and Hamilton found himself playing in the Third Division with Swindon Town. It proved a bad move from Millwall’s perspective, as they suffered relegation at the end of that season. Swindon almost passed Millwall going the other direction, eventually finishing just outside the promotion spots in fifth place. 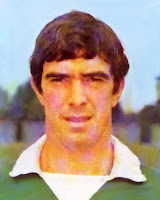 Recognised as one of Northern Ireland’s most experienced players, Hamilton was considered vice-captain to Allan Hunter, and led the team out a number of times through the late-seventies, including through both the 1978 and 1979 British Championship tournaments. Although Hamilton made just three appearances through the 1979/80 season, all from the bench, returning Northern Ireland manager, Billy Bingham, called him into the squad for the end-of-season ‘Centenary’ Tour to Australia, thus gifting him the chance to take his cap total to the magical fifty. Hamilton made his final Swindon Town appearance, starting his first game in a year-and-a-half, in a 3-0 defeat at Sheffield United on 6th September 1980. He was released that October to take the job of player-manager at financially stricken Division Four club, Tranmere Rovers. He took to the field regularly over the next three seasons, Tranmere’s limited resources not affording a large playing staff. Injury forced his retirement from playing mid-way through the 1983/84 season, his 372nd and final League match coming as a substitute in a 1-0 defeat by Darlington on 1st November 1983. He did pull his boots on once more in a competitive fixture, taking to the field for a 4-1 Freight Rover Trophy win over Blackpool in January 1985. A month later he was surprisingly sacked. Hamilton's management career took him on to Wigan Athletic, Leicester City, back to Wigan and finally to the Northern Ireland hotseat in 1994. Summary: 46(4)/4. Won 16, Drew 11, Lost 23. Remember Bryan was the guest of honour at a Boys' Brigade display in C'fergus in 1971. Great guy who signed our display programmes and answered all our questions about Bestie! Great servant to NI football.